The very Japanese Suzuki has long been renowned for designing small cars and SUVs (and motorbikes, but that’s another story.) 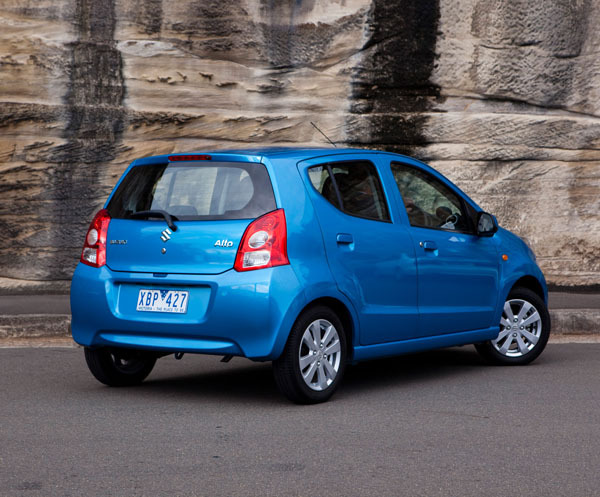 The Alto, is aimed at the budget end of the market, with prices beginning at around $14,000 on the road when brand new. The Alto is made in India by Maruti Suzuki. We’ve toured that factory and while it looks rather aged by today’s standards build quality is up there with the best in class. 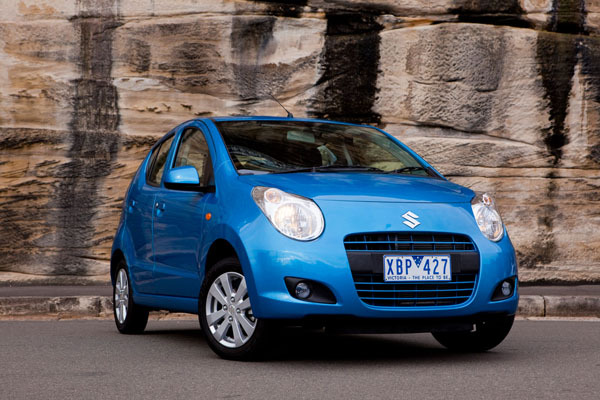 Australias’ motoring clubs: RACQ, RACV, NRMA, RAA and RACT, have often named the little Suzuki Alto the country’s cheapest car to own and operate. This often carried across to the Suzuki Celerio which replace the Alto in 2015. 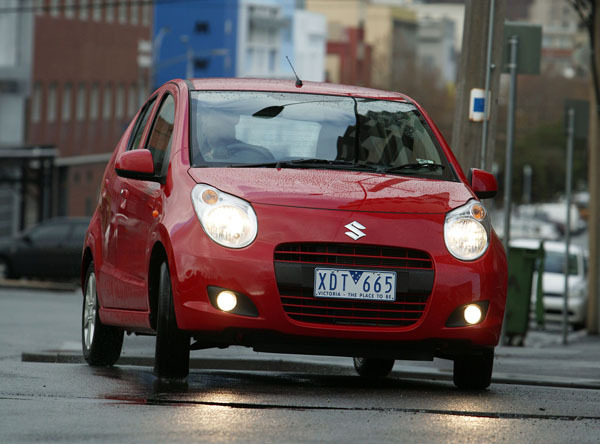 Suzuki Alto does not look, feel, or drive, like a car in the ‘light’ segment. Having four passenger doors is a bonus you don’t get in many cars at the bottom end of the market. The turning circle is a tight nine metres making it simple to park and to hustle through tight traffic. Obviously it’s aimed at city and suburban driving, but Alto is able to handle country trips without any real fuss. Probably best to avoid dirt roads, though. Specifications are on the basic side to keep prices down, but you do get air conditioning and a good array of active and passive safety features. The lowest priced Alto, the GL is a real stripper, Alto GLX is significantly better. The front seats are comfortable, the rear area has dual seating, with tight leg and headroom but good shoulder room for a couple of fair-sized blokes. In cars of this size compromises are inevitable and the little Suzuki has a small (110-litre) boot and not a lot of sizeable storage spaces in the cabin. The rear seats are 50:50 split units to increase the cargo area up to a maximum 754 litres. At the heart of the little Suzuki Alto is a three-cylinder, 1.0-litre engine. It has a purposeful note that intrudes nicely into the cabin. There’s something about small capacity engines’ willingness to work that appeals to those who enjoy driving. Transmission options are five-speed manual and four-speed automatic. The auto is best left to those doing heavy duty commuting as it does affect performance. Suzuki has been operating in Australia for many years and has a good dealer network. Though the dealers are principally in metro areas there are quite a few in the country as well due to the popularity of Suzuki 4WDs in the bush. Servicing and spare parts prices are generally reasonable and we haven’t heard any real complaints about the availability of spares. Insurance companies generally rate the Suzuki Alto in the lower part of their scales and we haven’t found and major difference in premiums between insurers. City cars live in a harsh environment. Make sure servicing, ideally by a Suzuki dealer, has been done according to time, not distance. The were three recalls on the Alto. Early models fuel pump seating on the fuel tank. Later models, stop lamp and shift solenoid, and heater motor. Suzuki dealers can check these have been done, or contact Suzuki with VIN for confirmation. Look for minor dings and scratches on the body, or signs they have been repaired. Check the condition of the wheels and tyres, the front-left one is usually the first to suffer through miss-parking. Look for damage within the boot due to heavy duty loading and careless packing. Make sure gearchanges on the manuals are light and easy, if not the ‘box may be damaged, or it could be a clutch problem. City cars live in a harsh environment, often in heavy traffic and running with engines that haven’t had time to warm up properly. Meaning very low readings on the odometer are not necessary a good thing.